if i don’t get the new one [which i hope i do] i will probably keep the old one in its box or send it back! first of all, how lucky! does the dummy button work? Got the new version from FP – dummy button is still a dummy (doesn’t rotate) but the light up effect, wire detailing on the emitter and overall look are much better than the original. Well worth a second one in my opinion. fingers crossed i will get the new version!!! do you just have to risk it if you order it from amazon? The one I ordered on sale yesterday from Amazon arrived today and it’s the new revised version with frosted plastic. Didn’t even realise they had updated it till I checked on here. Looks a million times better than the version I was expecting to arrive, I wasn’t too into the original sonic they made, thought I’d pull the trigger on it when the price was reduced, but I’d have paid full price for the version I got sent. Looks less like a cheap toy now. it also has a slightly darker appearance to the first release. Funny how CO online have just restocked as well -wonder if it’s the newer one? Silent, Did you see if it had Frosted Plastic in the middle now? and does it have two buttons? @WhovianLife I believe it is exactly the same as the 1st release but with a slightly darker paint application and different packaging. I didn’t notice any other differences, otherwise I would have bought myself another one ! does it have made in Sheffield! There’s a short behind the scenes video on the Doctor Who Facebook group of the Doctor making her new sonic screwdriver, Jamie Childs the director says that the actual prop has ‘Made in Sheffield’ stamped on it left over from the spoons and knives the Doctor melts down to make it. Jodie herself says the crystal emitter is taken from the alien warriors pod. Yes I’d like to publicly apologise to Character Options for my earlier ranting about the Se7en20 sonic being superior. I was wrong. I’m sorry I doubted you CO.
you were not alone, it may spin yet but the Character one is def the more screen accurate looking. I’m sure I noticed it spinning in s11 ep 2. Emitter rotates in Ep 3 – that said CO still looks more screen accurate. 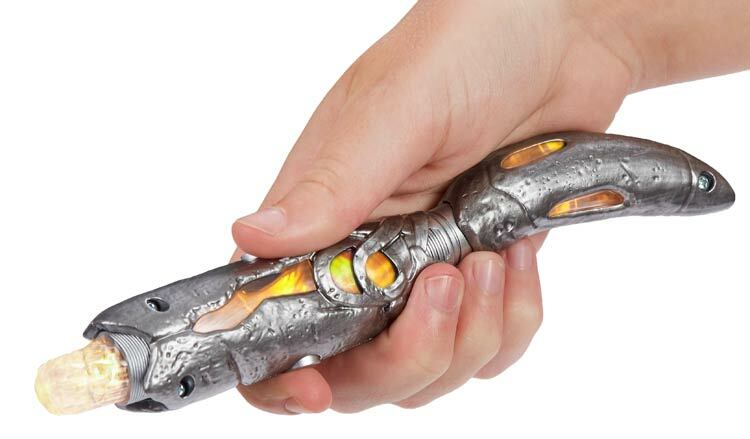 After seeing the concept art for the sonic screwdriver prop, and the Rubbertoe Replicas pictures, it looks like the crystal is held in place on the emitter. I think CO have the design really accurate. Seven20 have a lot of things wrong – the wood grain effect, the “twist” section, the smaller size. I think the company rebranding meant that they had to rush the release in a way, so they added the spinning feature to make it seem more cool and appealing. Agreed. Will be interesting to see the Wand Company’s version of the sonic if they produce them. It’s a shame the Doctor Who Adventures magazine halted, as the new series looks like it could draw in a lot of new viewers. Thing is, why have CO built a button onto it that does nothing? My guess is it will spin at some point in the series. I can’t imagine a piece of merchandise that is wholly wrong getting released. It would have had to be approved. I’ve ordered a seven20 so will be able to judge when both are side by side. Ok, although I’ve been trashing this sonic because the crystal doesn’t rotate and it has a button that does absolutely nothing, I ordered one from Amazon today. I think the announcement of the date for the first new episode has got me excited. 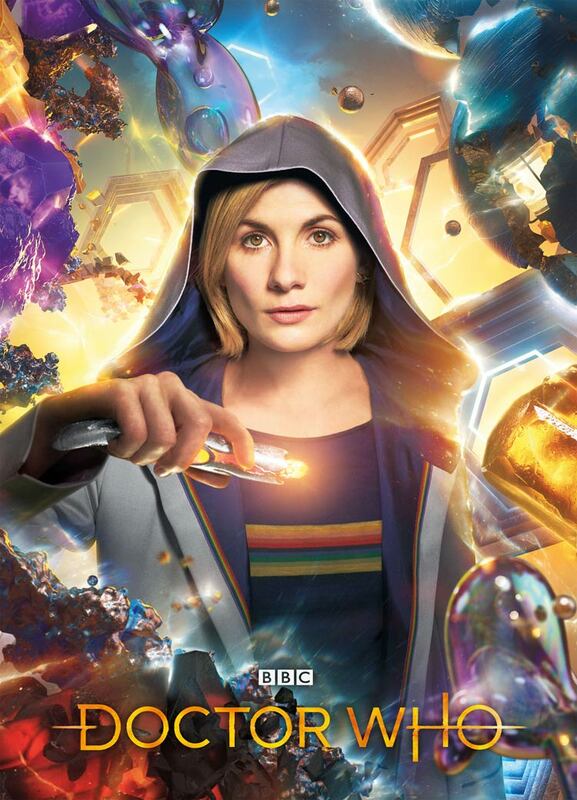 They’d better hurry up and reveal the new 5” action figure of Jodie because I very nearly ordered the doll as well. to be honest, the character one is the more screen accurate as in how it looks, we all want a 5″ figure but the doll is pretty good. I watched a comparison video on YouTube between this and the Se7en20 sonic and I think you’re right Booboo, the CO one does look more accurate. They’re both covered in annoying screw holes and until the show airs, we don’t even know if the crystal emitter is even supposed to rotate or the bottom section twist round. Plus I got it for £13.45 on Amazon because I’ve ordered one with slight damage to the packaging which is fine as I’m going to open it anyway. I also ordered the 12th Dr’s second sonic for £11.17 again with slight packaging damage. Both for £25 is great I thought. I got a bargain today in my local b&m, they’ve had one solitary 12th Dr’s 1st sonic on the shelves for over a year. I finally gave in and bought it and it scanned at the till for just £1.00. Brilliant! great thing, way more accurate than the seven20 version believe it or not!!!! got mine from Cardiff TV and movie store because you get to try out there sample one first! Sleek Design I love it ! Wonder if the latest version of tardis will be next thing they issue ! Argos availability’s very good ! I just got the doll today too ! Just collected my 13th doctor sonic from Argos. I have to say, I’m pretty pleased with it so far. These now seen to be arriving in Argos store’s, may take a couple is days to get to all stores. Once the first lot of stock has sold more are expected in. The doll figure will still be a week or more yet. I’ve reserved one at my local Argos. I’m going to collect it tomorrow. Saves me postage on a forbidden planet order. 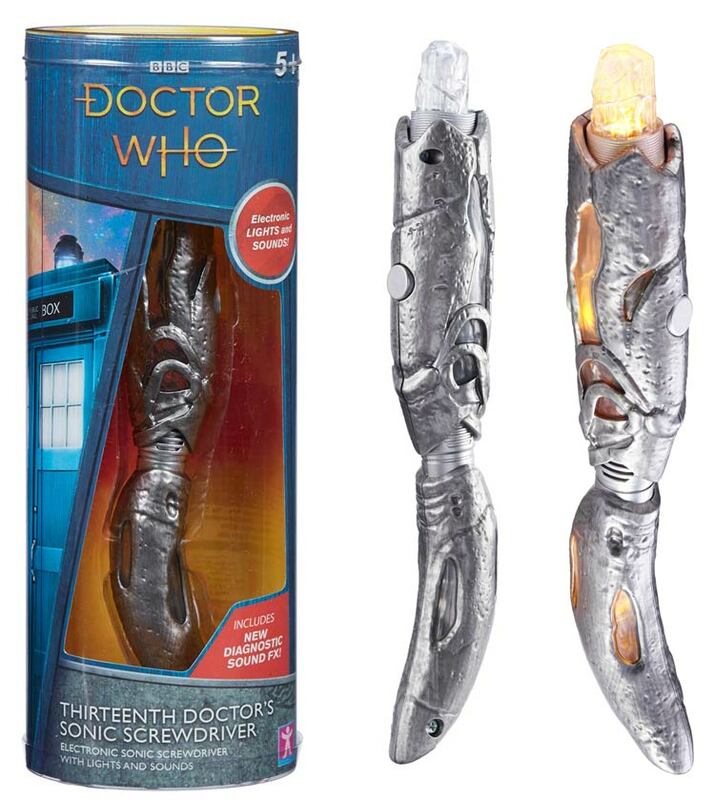 Has anyone had any information about orders of the sonic from Forbidden planet international website. I think screwdriver is selling quite well, both the forbidden planet’s near me have completely sold out of them! Mine arrived today from FP International! I wasn’t aware until now there were two different versions of it. The US one revealed at SDCC that comes with the rotating crystal, and the UK that doesn’t, and honestly I’m quite disappointed. I went into forbidden Planet on Tuesday and they had like six screwdrivers and four dolls (I bought a doll and I love it.) and then I went back in on Thursday and they had sold all the screw drivers and only had two dolls left! That’s a good sign!! Oh, brilliant! Mine arrived today!!! Arrived today. Has only one button that operates, the other being a dummy. Bit disappointed. Still awaiting 10inch doctor from FP. Booboo I couldn’t find the ask a question page but when I go to the b and m sets 2018 I can’t seem to comment or reply on them? Is this a bug or an error on my part? Is there any reviews online that compare the two Sonics side by side together? I’m very disappointed with forbidden planet international. They’re famous for dispaching items a year after you ordered them! Im still waiting on mine too. I should have learned from the time i preordered the 3.75 inch Clara . It too forever to come and everyone else had theirs . Anyone know if FP Glasgow still has this and the folk in stock. Going there on Wednesday so hopefully they might have some left or have re stocked.